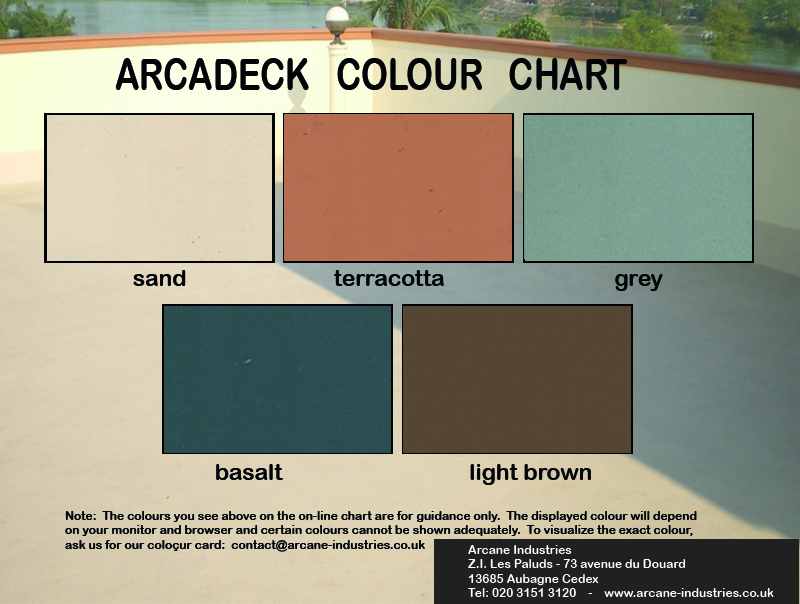 ARCADECK is a decorative and protective paint for terraces, patios, balconies and roof terraces subject to foot traffic. ARCADECK will cover and protect the substrate by preventing it from deterioration caused by foot traffic, cracking and water ingress. adheres to all building materials (cement, concrete, stone, tiling, brick....). no extra thickness or weight to your original surface (important if door opens onto the terrace or builiding regulations limit the weight. * Note:. The displayed colour depends on your monitor and browser - to visualize the actual colour, ask us for our colour card. ARCADECK is designed to waterproof terraced areas built on porous substrates. ARCADECK will not modify the original structure with added weight or size. Our waterproofing solution is ideal to waterproof your deck, terrace or balcony if your building regulations limit the weight of your structure. Whereas extra product thickness will prevent a door from opening out onto your terrace, ARCADECK is the ideal solution to achieve a new waterproof deck which will leave your original deck unchanged in size. ARCADECK, ideal for use on new and old exterior porous substrates (cement,concrete,stone, tiling and brick) provides a decorative matt finish paint. Do not cover ARCADCECK with gravel. Optimum performance is achieved by using the right combination of products, surface preparation and application procedures. The surface to be treated must be dry, sound and prepared prior to application. Ensure that all the laitance has been removed from the surface with a standard cement residue remover. Repair all active cracks with ARCAROOF/ARCAMESH (or eventually ARCADECK + ARCAMESH) before treating. In presence of large cracks over a large surface area, contact our technical services. Use ARCAFIX, a water resistant binding material, to reinforce crumbling cement and masonry substrates before applying ARCADECK. Tiling should be rubbed raw through abrasion or sanding before application. Wait 28 days before painting on a new fresh cement block. Eliminate any cement film or laitance with an acid wash before applying. Apply a primer coat (50% ARCADECK, 50% water) to the substrate. Let dry 1 to 2 hours. Apply a 1st coat of undiluted ARCADECK - 0.750 L/m2 Let dry 24 hours. Note: 1.5 L per M2 should be used. If you are under these amounts, an additional coat should be applied. * Do not cover ARCADECK with gravel. Keep out of direct light, away from extreme heat and freezing. Two coats are necessary to guarantee the performance of ARCADECK. Arcadeck can be covered after 24 hours.